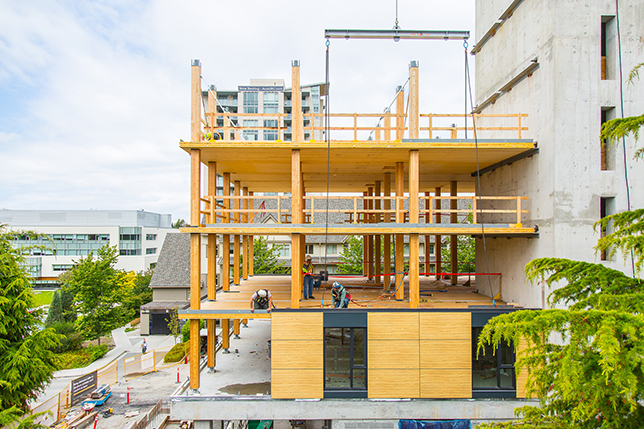 New UBC residence is world’s tallest wood building. While British Columbia’s worst wildfire season in decades raged across the province this past summer, the University of British Columbia put wood in the spotlight for a different reason: in July, it opened the world’s tallest contemporary hybrid mass timber building. Tallwood House is part of Brock Commons – the latest student housing area at UBC. Just over 400 upper-level and graduate students now call Tallwood House their home, helping shrink the university’s residence waitlist, which peaked this summer at 6,000 people (a second building opened this summer, offering another nearly 350 beds). Tallwood House, however, stands out among the crowd. Literally. Clocking in at an impressive 18 storeys, or 53 metres, the residence has some of UBC’s best views of the North Shore Mountains across the Pacific Ocean. “I’m positive everyone will enjoy the view,” says John Metras, the university’s managing director of infrastructure development. It’s not all sweeping vistas though. Tallwood House also boasts environmental sustainability thanks to the fact that wood stores carbon dioxide and preparing wood for construction creates fewer greenhouse gases than producing steel or concrete. To quell any fears of fire hazard, the timber is coated in three layers of fire-rated drywall. “We probably did more than we needed to,” muses Mr. Metras. He notes, however, that Tallwood House cost approximately eight to 10 percent more than the typical residence build, thanks to necessary research and design planning before construction – and the material itself, which Mr. Metras believes will one day be on par with the price of concrete. Until then, Tallwood House stands alone. Builders work on the Tallwood building in 2016. The building officially opened in July 2017. Fire has obviously been considered but no mention has been made of steps taken to handle earthquakes. The west coast is supposedly part of the Pacific’s rim of fire. Anything done to survive earthquakes?